Lot # 316: 1968 O-Pee-Chee #50 Willie Mays (PSA Gem Mint 10) - The SOLE PSA “Gem Mint 10” Example! 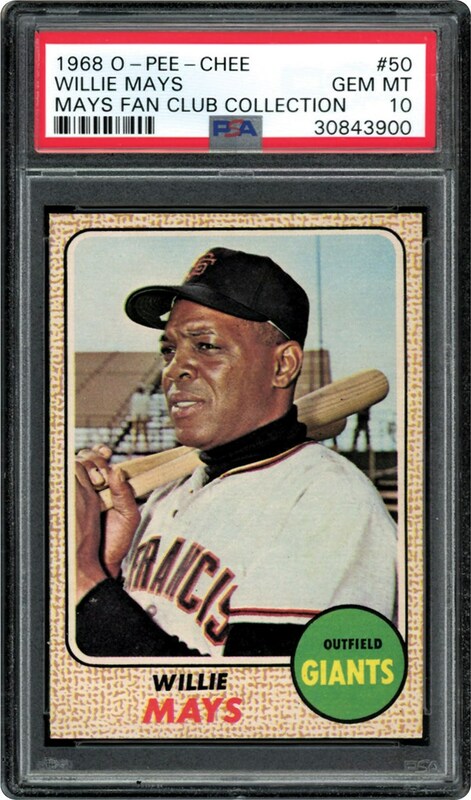 1968 O-Pee-Chee #50 Willie Mays (PSA Gem Mint 10) - The SOLE PSA "Gem Mint 10" Example! One of the world-class "Mays Fan Club Collection" offerings is this breathtaking 1968 O-Pee-Chee PSA "Gem Mint 10" marvel that stands alone as the SOLE example at this perfect assessment! The 1968 season would see Willie Mays slightly rebound from a sub-par 1967 campaign, with the "Say Hey Kid's" statistics revealing increases in virtually all pertinent hitting categories such as homers, RBI's, batting average and OPS. True, the 37-year olds' skill sets were slowly diminishing, but his iconic legacy was surely intact. The imposing Willie Mays "bat over shoulder" image reveals not a single blemish, with his good-natured smile and sparkling hues stealing the show. The crystal-clear illustration reveals atypical near-perfect centering between the flawless-like borders, with a majority of 1968 subjects revealing skewed images. The ultra-sharp corner tips could draw blood, the surfaces are "pack-fresh" and we cannot detect any blemishes whatsoever on either side. 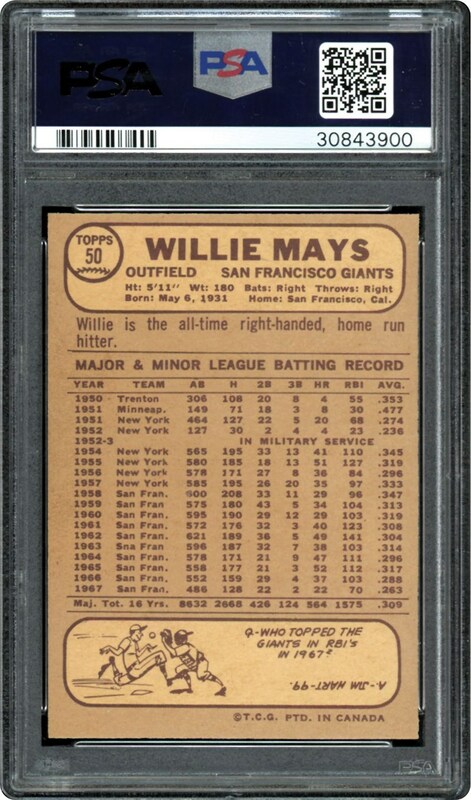 As close to the perfect 1968 Mays subject as you may ever find, its pristine technical attributes and unparalleled eye appeal combine to justify the "UNIQUE FOR THE GRADE" PSA 10 assessment that synonymous with Mays unparalleled career, places it as the undisputed finest 1968 "O-Pee-Chee" Mays marvel on the planet!